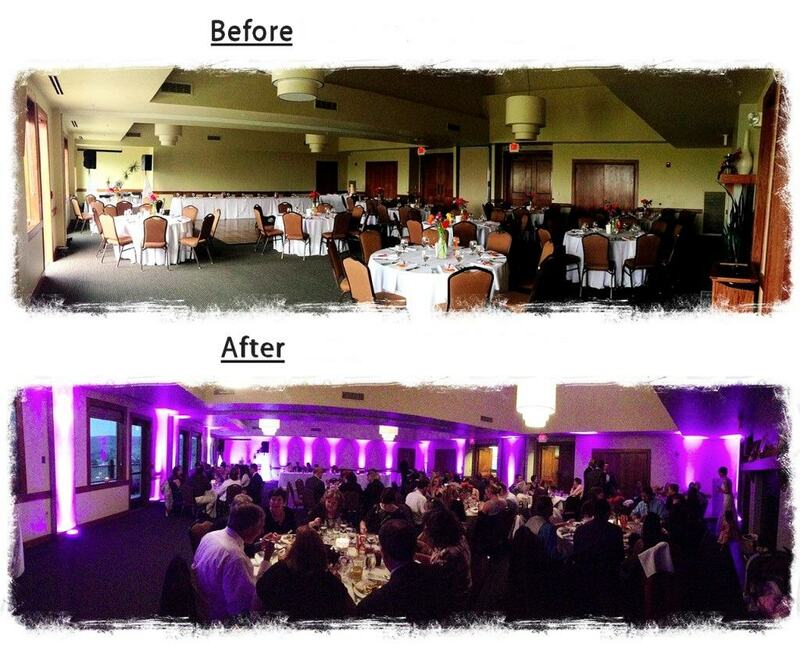 Up lighting can be an incredible tool for your wedding reception if done correctly. As with any other type of decor, there are certain guidelines a bride and groom should follow when planning the lighting for their wedding. As The tri-states top wedding and event lighting company Spectrum Sound would like to offer you a few words of wisdom when it comes to up lighting. It is critical that when you and your fiancé decide you want up lighting, hire a PROFESSIONAL is for the job. SKILLED Lighting techs know where and how to place the lights, so they add architectural effects and look aesthetically pleasing. Don’t pick a color that won’t pop from your walls, for example, neutral or subtle colors. The point of up lighting is to add something extra to the room! Favorite colors among weddings are aqua, dark purple, magenta, and light pink. Pay close attention to the colors of your wall in your reception room. A dark purple-up light won’t work with dark walls choose something lighter to balance the darkness of the room! Make sure the colors complement your chosen wedding colors. Having green accents around the table and then mixing it with a light pink up light might clash. There are several different types of lights a lighting company might use at special events. Most companies use LED lights or Incandescent cans/fixtures. Spectrum Event Design recommends that you always request LED up lights. LED up lights do not heat up like Incandescent cans that can become a safety issue especially with small children at the wedding. Incandescent fixtures also use more power (more noticeable cords), and there is a limit for color choice. Incandescent cans use a colored gel paper to cover the lamp. Unfortunately, if the color isn’t exactly to your liking the day of the event, there is no way to change the shade. Not a problem when using LED up lights. With LED up lights, your lighting technician can instantly change the color of your up lights. Most of our brides request between twenty and thirty up lights for their reception. The number of lights depends on how large the room is and what is being accepted. Going overboard with up lights can completely wash the entire room, and your wedding pictures will have a colored tint to them. On the other hand, it will be painfully noticeable to you and your guests if a whole wall is missing up lights. Important architectural spots to accent with up lights are columns, doorways, and corners. 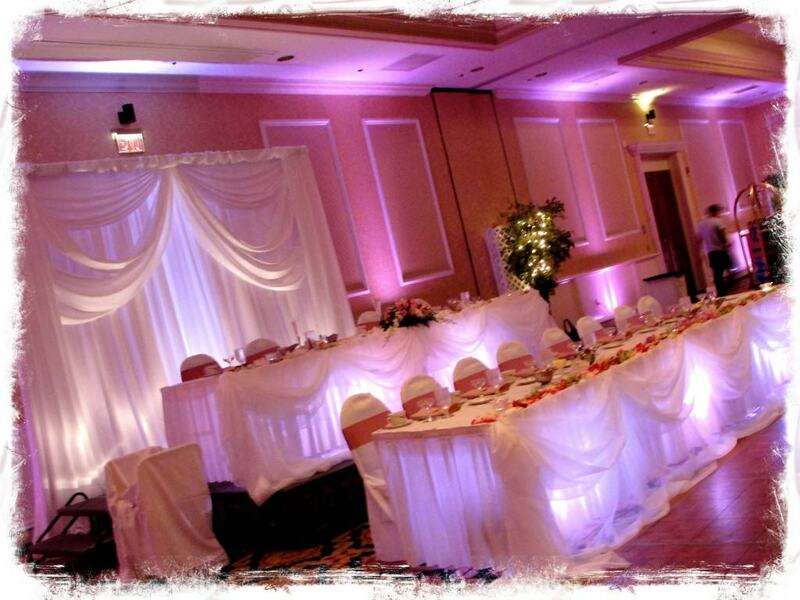 Don’t forget, up lighting colors will set the mood for your reception. A light pink up light will create a romantic mood while a bright purple will have more of a dance club vibe. The most important thing about up lighting is that it looks exactly how you and your fiancée imagined it would! If you would like to meet the most experienced, fun, and versatile DJ professionals and MC’S in the TRI -STATE area, call my office at 1.812.401.4931, and we can arrange a no-obligation consultation. Pick up the phone and call 1-812-401-4931 today! DJ/MC/VJ Terry Tunks and his talented team of entertainers have entertained at any thousands of events over the years. Evansville, Indiana, Newburgh, Indiana, Owensboro, KY and all across Southern Indiana and Kentucky. In towns like JASPER, FERDINAND, FRENCH LICK, WEST BADEN, NEW HARMONY, NEW HARMONY, HUNTINGBURG, AND SANTA CLAUS, IN. Based at one time in Louisville, KY As a result of sponsorship of Coca – Cola. SPECTRUM SOUND is just as comfortable entertaining small groups at a casual affair to 18,000 at the THUNDER OVER LOUISVILLE DERBY CELEBRATION. Spectrum Sound Serving as a DJ/MC/VJ, Lighting and Sound Technician, Event Planner Coordinator. Your Facilitator to Ensure, your Special Event, is an Enormous Success! All documents and Articles given by Terry Tunks and Spectrum Sound may not be reproduced in any form, including copying elements design for any personal and commercial use.